Twin City Spiritualist News, The. 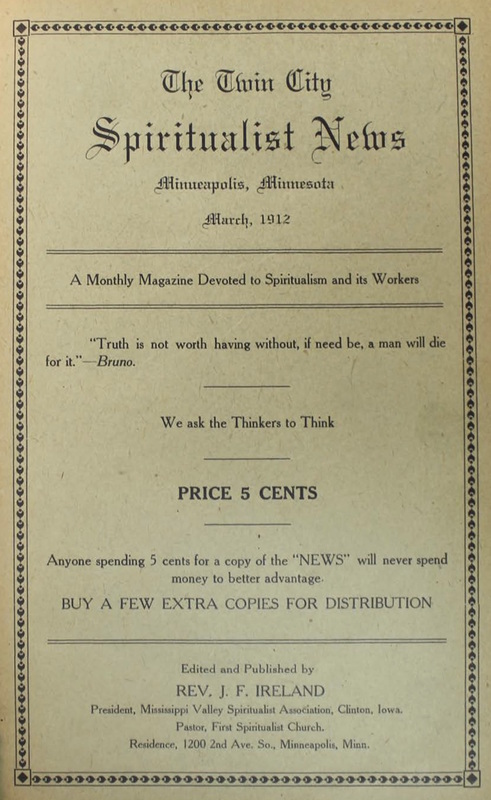 A Monthly Magazine Devoted to Spiritualism and its Workers. Minneapolis, MN. Editor: Rev. J.F. Ireland. 18 pp, 5 cents a copy. Ireland was the president of the Mississippi Valley Spiritualist Association in Clinton, Iowa, and pastor of the First Spiritualist Church in Minneapolis. The journal seems to have been the vehicle for publication of Ireland's sermons. One issue at NSAC, Lily Dale.